The Mumbai-Pune Expressway is India’s first six-lane concrete, high-speed, access controlled expressway. It spans a distance of 94.5 km connecting Mumbai and Pune, It was fully operational in the year 2002. 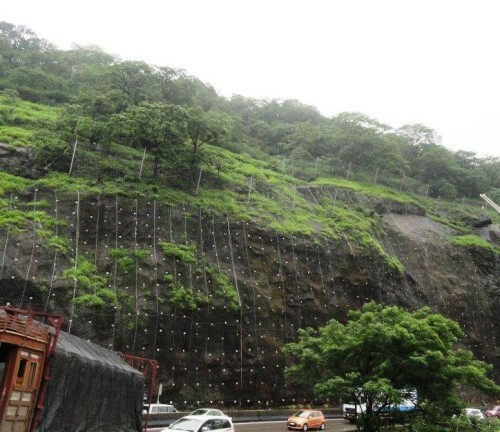 The Mumbai-Pune expressway has been experiencing the problem of rockfall and subsidence at a few locations, which affects the traffic during the monsoon season. The frequent incidences of rock fall causes disruption of traffic, property loss and loss of life, particularly near the Khandala and the Adoshi tunnels. Based on a series of rockfall events and observations made, critical stretches were identified; Khandala tunnel-Pune side, Adoshi tunnel, Amrutanjan Bridge, Khandala tunnel-Mumbai side, and stretch near Bhatan tunnel. Based on inputs gathered from engineering investigations, solutions for rockfall mitigation included secured drapery systems and dynamic rockfall barriers. Design analysis of the interventions was carried out using Rocplane and Rocfall software. Secured drapery system was selected to stabilize of the rock mass surface containing potentially unstable rocks of a volume typically 1 cubic meter to 1.5 cubic meter. The weathered rock slope was draped with combination of mono-oriented Steelgrid and High Energy Absorption (HEA) panels. This drapery system was anchored to the slope with anchor bars with a depth varying from 2m to 8m. Dynamic Rockfall barrier in the range of 250kJ to 8600kJ capacity and with different heights were installed. Maccaferri’s dynamic barriers intercept and stop falling rocks and boulders. The intercepting panels are connected to structural elements, which in turn are connected to anchorage lines, braking systems and foundations. The expressway has high importance as it connects the two twin cities, Mumbai-Economic C and Pune, The Cultural Capital of Maharashtra. Accordingly, the landslide news was covered by various media then.